Visual controls are an important part of Lean management. They are simple and practical ways of reminding us of what to do or not do, and signal to us the existence of abnormal conditions. In addition, they are fun to create and an opportunity to share ideas and improve teamwork. 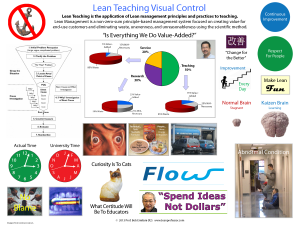 Last year I posted a one page, two-sided Lean Teaching Visual Control in the Resources page. It contains information that is helpful for improving one’s teaching. Click on the image at right to view or download the .pdf file. People really like this visual control. I’ve seen examples of faculty posting them in their office and carrying them around to meetings pertaining to teaching as well as administrative work. I hope that you have found it to be helpful. I now have added a new one-page, two-sided visual control that you may find to be more useful. Click on the image at right to view or download the .pdf file. 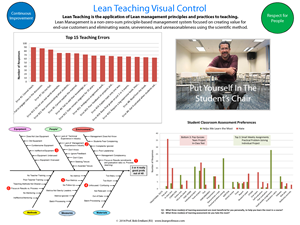 This visual control has a more direct focus on recognizing or avoiding problems in teaching that can reduce the impact of teaching or leave students with the perception that the quality of teaching was low. I hope you find it useful. I’d love to know which of the two visual controls you find more useful by replying to this post. Thank you.